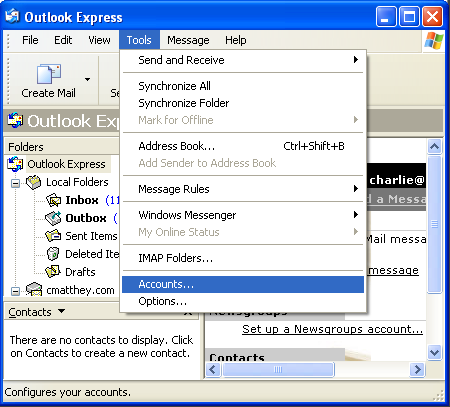 Note: if you're opening Outlook Express for the first time, you will not see the window below. You will see the Internet Connection Wizard. Click here to jump to that screenshot. 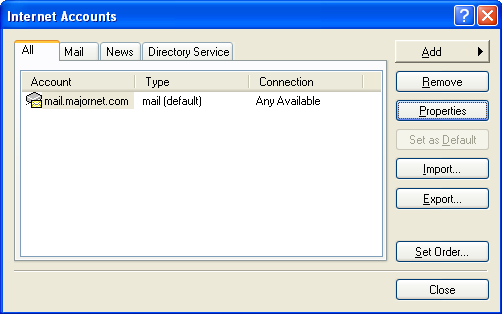 On the Toolbar, click Tools and select Accounts from the menu. The Internet Accounts window opens. Toward the top, right corner, click Add and select Mail from the menu. 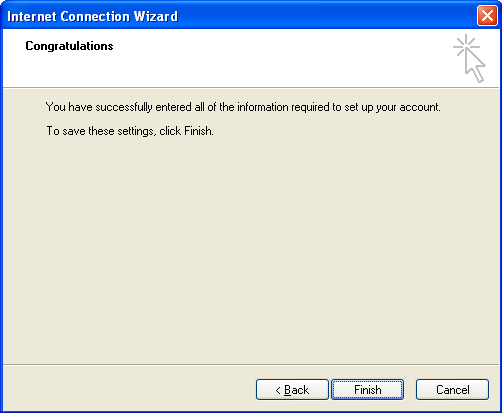 The Internet Connection Wizard launches. Display name = Enter your email address. E-mail address = Enter your e-mail address. My Incoming mail server is a ? server = This should be set to POP3. 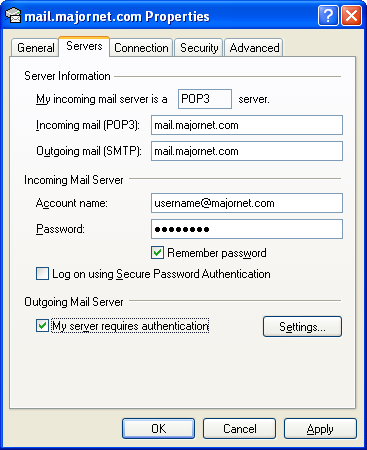 The Incoming (POP3) mail server is mail.majornet.com. 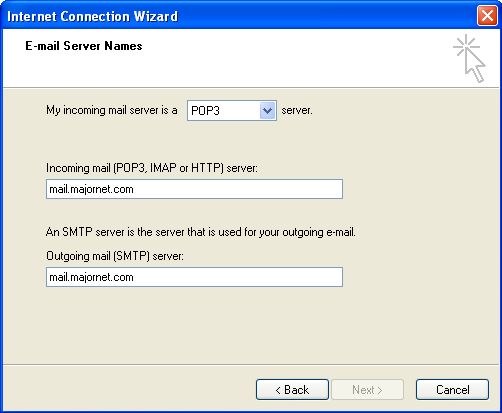 The Outgoing (SMTP) mail server is mail.majornet.com. 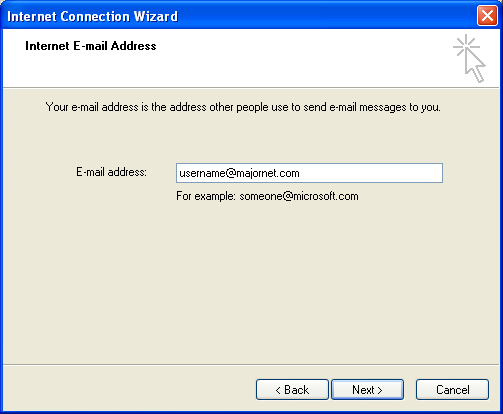 Account name = Enter your e-mail address once again. 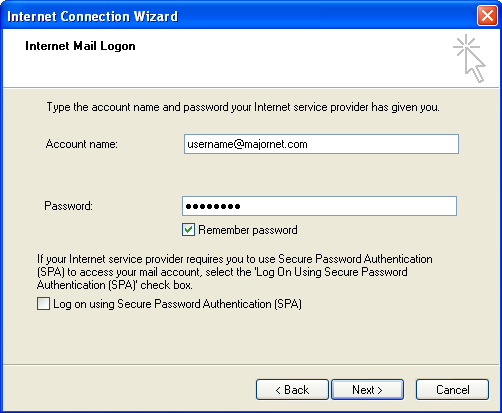 Password = Enter the password to your e-mail account. Important: Passwords are case-sensitive. Ensure your Caps Lock is disabled. Important: Do NOT select Log on using 'Secure Password Authentication'. Important: You still need to enable SMTP authentication. You'll see how to do this in the following screenshots. The Internet Accounts window appears. Highlight the desired account and click Properties. 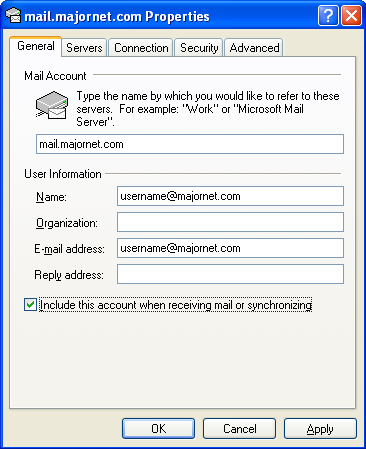 Important: Ensure Include this account when receiving mail or synchronizing is checked. Towards the bottom, left corner there is a box: My server requires authentication. Check it. Finally, click the "Advanced" tab. You will need to change the outgoing port. Next to "Outgoing mail (SMTP)", put the number 587. 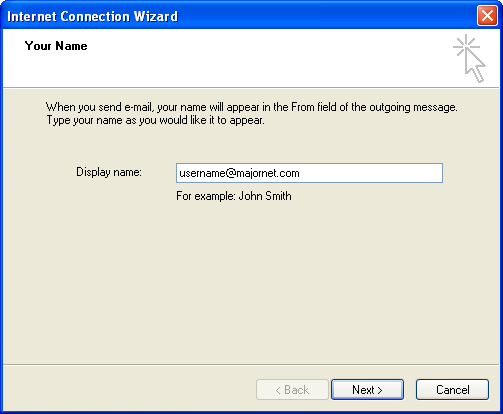 That completes the setup of your majornet.com email address..